I have a confession to make. I'm a little embarrassed to admit that I became completely hooked on I'm a Celebrity Get Me Out of Here! I think I watched every episode and was cheering for the fabulous Chrissie Swan to win (she came third). I was also cheering when Julie Goodwin arrived as an intruder because she was fabulous on MasterChef and I have her cookbooks. During the show Julie made her Lemon Diva Cupcakes so guess what I couldn't resist making the next day? There is a reason these have become famous - they are completely delicious! I haven't made cupcakes for ages and it's been even longer since I used a piping bag. My piping skills are atrocious but the taste more than made up for that. If you like lemon you will love these cupcakes! I made a few changes to the recipe like using rice malt syrup instead of sugar in the cupcakes and dextrose in the icing but other than that it is as per the original. Perfect for afternoon tea. Make them!! Preheat the oven to 160 degrees C fan-forced. Line a 12-hole muffin pan with paper cases. Using a stand mixer or electric beaters, beat together the butter, syrup, lemon zest and vanilla until light and creamy. Add the eggs one at a time, beating well after each. Alternately fold through the flour and milk in two batches. Spoon the mixture evenly into the paper cases. Bake for around 20 minutes or until golden brown and the centre springs back when touched. Place on a wire rack to cool completely before decorating. 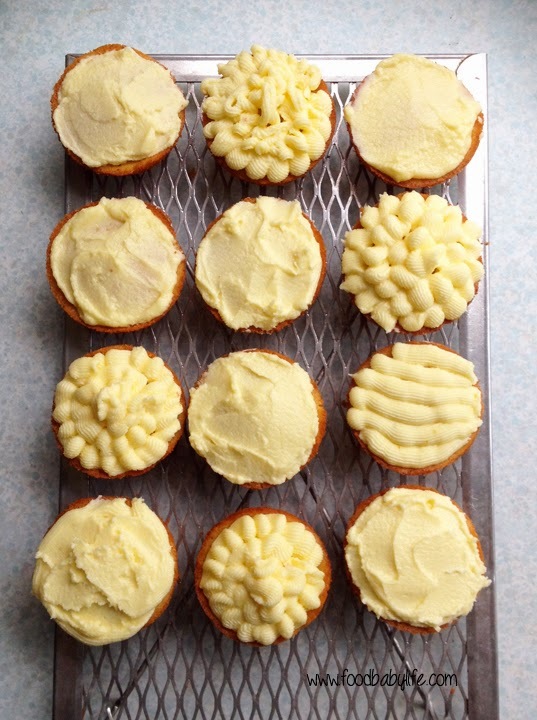 To make the icing, beat the butter until light and creamy using electric beaters. Add the dextrose a little at a time, beating constantly. Add half the lemon juice and beat well. Add the remaining lemon juice a little at a time. Pipe the icing onto the cooled cupcakes (Julie recommends a 1cm fluted nozzle which I don’t have).